NVAR is dedicated to keeping members of the press and various news media up-to-date and informed on the ever-changing world of Real Estate. NVAR is constantly staying in the forefront of news to keep you informed with changes in government affairs, education, technology and housing market trends. View archived press releases and check out our latest news and trends, which includes articles from our RE+View Magazine. If you are a member of the press/media and would like to be added to our list, please contact Ann Gutkin at agutkin@nvar.com or 703-207-3216. Please also download the NVAR Fact Sheet for more information. Fairfax – “With mortgage interest rates at a 10-month low, and our regional home sales at a 10-plus-year high, Northern Virginia Realtors® anticipate an active spring market,” said Ryan Conrad, CEO of the Northern Virginia Association of Realtors®. January home sales in the NVAR region, which includes Fairfax and Arlington counties, the cities of Alexandria, Fairfax and Falls Church and the towns of Vienna, Herndon and Clifton, rose to 1,127, the highest number of January home sales here since 2007. For the third consecutive month, the number of “New Under Contracts” in the NVAR region – contracts which may include contingencies – were up year-over-year by at least 70 percent. “Interest rates remaining low, the excitement of Amazon and what’s to come with Virginia Tech’s new center have definitely impacted the buyer pool,” said Rachel Carter, branch vice president of Coldwell Banker Residential Brokerage in Alexandria and chair of the NVAR Technology Advisory Group. “For condo listings in the Pentagon City/National Landing area, we saw ‘packs’ of investors on tour at our open houses,” she said. Carter’s Alexandria office in January saw significant increases in closed volume, average sales prices and sides compared with January 2018, she explained. “Interestingly, the rentals that we’ve closed also saw a solid increase in closed price year over year. We are clearly seeing more activity and an ‘early spring,’” Carter said. Inventory is top of mind for many area homebuyers and real estate professionals. “The number of homes for sale is down 20 percent from January of 2018,” said Richardson. “In addition, the average days on market is down from 80 days in 2018 to 63 days in 2019, a more than 21 percent drop. The average sales price is holding steady, however, at $565,000 in January 2019 compared to $567,000 in the same month last year. Given these factors, sales prices should rise as we move through the traditionally busy spring market,” she said. The Arlington market, arguably most impacted by potential Amazon activity, continued to thrive in January. It outpaced the NVAR region as a whole, with a median sold price of $615,000, up by 20 percent over the prior year. The number of January sales in Arlington grew by 7 percent compared with January 2018. The Northern Virginia Association of Realtors® serves as The Voice for Real Estate in Northern Virginia and provides a variety of services to its members including educational opportunities, professional standards enforcement, market statistics, legislative reviews, issues lobbying, multiple listing and lockbox services, and more. The purpose of NVAR is to enhance the ability and opportunity of its members to conduct their business successfully, to promote member professional competency, to maintain members’ adherence to the Realtor® Code of Ethics and to promote the preservation of the right to own, transfer and use real property. NVAR has grown to about 12,000+ Realtors® who carry out a real estate industry in a community of more than 2 million residents. Visit NVAR online at www.nvar.com, www.realtorschool.com, and www.realtorshop.com. Contact the Northern Virginia Association of Realtors® at 703.207.3200. The NVAR headquarters is located at: 8407 Pennell Street, Fairfax, VA 22031, with a second service center located in Herndon. NVAR leaders signing an Honorary Reciprocal Agreement with the leaders of the Cambodian delegation. NVAR offers all members the chance to participate in Korean, Vietnamese, Hispanic and International Business forums, according to NVAR Chairman of the Board Virgil Frizzell. “Our global forums help communicate the importance of international real estate opportunities and teach our members about how to handle multicultural real estate transactions correctly,” said Frizzell. 1. Frizzell served as a panelist in Lima, Peru at the COIPRO 2016 conference alongside Elizabeth Mendenhall, 2017 President-Elect of the National Association of Realtors®. He discussed the role of the real estate agent in transactions at an event hosted by the Peruvian Association of Real Estate Agents on Sept. 20, 2016. 2. NAR offers ambassador opportunities to more than 40 countries where there is reciprocal cooperation with a local real estate agent association. NAR selected five NVAR members to represent the United States Realtors® with another country or region. Spain: Veronica Seva-Gonzalez, Compass, Washington, D.C.
3. NVAR hosted its 3rd Annual Realtor Showcase of Ideas and Innovative Concepts during in May with over 60 attendees of which 20 were are from allied associations in 9 countries all over the globe. 4. NVAR hosted a Cambodian Delegation for three days in November. During that visit, NVAR leaders signed an Honorary Reciprocal Agreement with the leaders of the Cambodian delegation. Image shown above. 5. Eighty Realtors® from Northern Virginia and across the United States earned the Certified International Property Specialist Designation (CIPS) during a week-long training class at its Fairfax Headquarters. The designation, sanctioned by the National Association of Realtors®, seeks to provide Realtors® with the knowledge, research, network and tools to globalize their business and better serve international clients. Fairfax, VA – The Northern Virginia Association of Realtors® has as a strategic priority to serve as an excellent corporate citizen. Such outreach is not only good business, but it is the right thing to do for an association that has 12,000 real estate practitioners as its core constituents. When installed in December 2016, the 2017 NVAR Chairman of the Board Bob Adamson challenged member-brokerages to participate in the inaugural NVAR Realtor® Community Action Day, which took place this past April. He asked members to find ways to give back to the charities of their choice with time, sweat equity, service and funding. 6. A team from Keller Williams Capital Properties raised $15k for Roc Solid Foundation for children with cancer and Main Street Child Development Center at a gala fundraiser. Fairfax, VA – The Northern Virginia Association of Realtors® announces the outreach and philanthropy of its 2016 NVAR Cares Committee. This committee considered proposals for funding from local nonprofit organizations and associations this year and made decisions to donate time and money based on each mission’s alignment with NVAR’s goal for charitable giving. More than $37,000 was donated. NVAR Cares and the NVAR Board of Directors proudly announce a $10,000 contribution to the Louisiana Realtor Relief Foundation to benefit Louisiana residents in need, impacted by the August 2016 flooding. “This year presented many challenges to our neighbors in need as well as those in Louisiana,” said Virgil Frizzell, 2016 NVAR Chairman of the Board. “We, at the Northern Virginia Association of Realtors®, are committed to giving back to our communities by volunteering and with donations." Frizzell is a Realtor® with Long & Foster Real Estate in Reston. “Good housing helps to achieve good quality of life,” said the 2016 NVAR Cares Committee Chair Susan Mekenney. She is an associate broker with RE/MAX Executives in Springfield. 1. Asian-American Homeownership Counseling Inc.
Fairfax, VA –Members of the Northern Virginia Association of Realtors® celebrated its volunteer leadership in a year marked by modestly increased sales compared to 2015, mostly horizontal price growth and continued low interest rates. NVAR’s Appreciation and Installation ceremony took place on December, 1, 2016 at its Fairfax headquarters. Led by Virgil Frizzell, 2016 Chairman of the Board, the association honored its outgoing 2016 leadership and award winners and welcomed incoming leaders. David Howell, the 1995 NVAR Chair, conducted the installation. Howell is the executive vice president of McEnearney Associates in Arlington. Thurs., Nov. 10, 8:30 a.m.
What Will They Mean for the Northern Virginia Real Estate market? Fairfax, VA – Join the Northern Virginia Association of Realtors® and the George Mason University Center for Regional Analysis for their 20th Annual Economic Summit on Thursday, Nov. 10, 2016 at 8:30 a.m. at the Fairview Park Marriott, Falls Church, Virginia. A. Who Is Buying Homes? Who Is Not/Why? Front-row seating; free parking; continental breakfast. Fairfax, VA –The Northern Virginia Association of Realtors® teamed up with the Matrix Group International, Inc. to create a new website, NVAR.com, that offers a leading-edge three-audience experience. Recognizing the distinct audiences for Northern Virginia real estate information, the redesigned NVAR website highlights the most relevant content and areas of interest for each user. Launched on Jan. 5, 2017, the new NVAR.com delivers a tailored browsing experience for every visitor. According to the 2017 NVAR Chairman of the Board Bob Adamson, “Our new NVAR.com consumer audience portal provides real estate market facts and information about the significant role of Realtors® and affiliated service providers in all phases of the transaction process. More than 2 million residents are in our NVAR footprint,” Adamson said. “This represents one of the most active real estate markets in the country,” he explained. intuitive, simple navigation to help users find information with ease. Nisha Thakker to Lead Association’s Strategic Partnership Program Strategic Partnership Goals and Leading-Edge Product Development to Be Pursued. Fairfax, VA – The Northern Virginia Association of Realtors® announces the appointment today of Nisha Thakker to the newly-created position of Senior Director of Strategic Partnerships. In her new role, Thakker lead NVAR’s strategic sponsorship and affiliate partner program to develop a greater membership value proposition for the association’s 12,000 Realtor® and affiliated service provider members. “The creation of this new senior-level position, with the selection of our former Associate General Counsel Nisha Thakker at the helm, will help us advance and cultivate NVAR’s relationships in the Northern Virginia business community,” said CEO Ryan Conrad. “The combination of Nisha’s legal expertise and business acumen makes her uniquely well positioned for this new role,” Conrad said. Thakker will serve as a partner outreach and product development leader for NVAR. In this new capacity, working across all association departments, she will cultivate existing sponsors and partners as well as forge new strategic alliances. Her work will help create a more engaged membership and help the association deliver new products and services. Thakker is a graduate of the George Washington University and the Washington College of Law at American University. Fairfax, VA –NVAR’s Appreciation and Installation ceremony took place on December 7, 2017 at its Fairfax headquarters with 2017 NVAR Chairman of the Board Bob Adamson thanking the membership for stepping up regarding their charitable community outreach, showing that they are not just Realtors®, but professionals who really care about their neighbors in need. Berkshire Hathaway Home Services Realtor® Deborah Baisden, Virginia Beach, installed the incoming NVAR Board of Directors and then Lorraine Arora as the 2018 Chairman of the Board. Baisden was the 2015 president of the Virginia Realtors®. Arora, a managing broker with Weichert, Realtors®, had also served as a managing broker for Long & Foster Real Estate in Springfield and Coldwell Banker in Arlington. She has been a practitioner in Northern Virginia for two decades. In addition to installing its 2018 leaders, NVAR awarded its first NVAR Hero Award to Stacy Hennessey of McEnearney Associates in Arlington, and presented Affiliate of the Year, Hall of Fame and Honorary Life Member Awards noted below. For a photo of Lorraine Arora, NVAR 2018 Chairman of the Board, click here. The Northern Virginia Association of Realtors® serves as The Voice For Real Estate in Northern Virginia and provides a variety of services to its members including educational opportunities, professional standards enforcement, market statistics, legislative reviews, issues lobbying, multiple listing and lockbox services, and more. The purpose of NVAR is to enhance the ability and opportunity of its members to conduct their business successfully, to promote member professional competency, to maintain members’ adherence to the Realtor® Code of Ethics and to promote the preservation of the right to own, transfer and use real property. NVAR has grown to more than 12,000 Realtors® and business affiliates who carry out an estimated $11 billion real estate industry in a community of more than 2 million residents. Fairfax, VA – The Northern Virginia Association of Realtors® announces the outreach and philanthropy of its 2017 NVAR Cares Committee. This committee considered proposals for funding from 50 local nonprofits and foundations this year and made decisions to donate time and money based on each mission’s alignment with NVAR’s goal for charitable giving. In addition, NVAR awarded its inaugural NVAR Hero Award to a member who was exemplary in giving back to the community. The winning recipient was McEnearney Associates Realtor® Stacy Hennessey, a practitioner for 10 years, who was selected because of her fundraising and support services to the Homestretch nonprofit. Homestretch's mission is to empower homeless families to attain permanent housing and self-sufficiency by giving them the skills, knowledge and hope that its clients need to become productive members of the community. Homestretch, a Falls Church based nonprofit, is becoming a national model for organizations that serve homeless families by providing a comprehensive and personalized approach to redirect futures on a positive path, according to Hennessey. In addition to local nonprofits, NVAR supported communities affected by severe weather in Texas, Florida and Puerto Rico. “As an association of professionals who are dedicated to helping people find housing, it is important that we, as Realtors, donate our time, talent and funds to those in need, whether that be in our own backyards or nationwide,” 2017 NVAR Chairman Bob Adamson said. NVAR has grown to more than12,000 Realtors® and business affiliates who carry out an estimated $11 billion real estate industry in a community of more than 2 million residents. Visit NVAR online at www.nvar.com, www.realtorschool.com, and www.realtorshop.com. Fairfax – While 2017 homeownership rates have reached the highest level since mid-2014 according to Census Bureau data, and 2017 home prices reached new highs for the past decade, we are starting this year off with solid rises in home values, said Lorraine Arora, the 2018 NVAR Chairman of the Board and Weichert, Realtors® Fairfax regional managing broker. If such robust growth continues, explained Arora, then this year’s Northern Virginia housing market will likely increase by 2 percent compared to 2017 sales numbers. Suspecting that Northern Virginia housing will see an early, strong spring market, Rob Allen, a 2018 NVAR Board member and Long and Foster Realtor® in Reston, remains confident that houses that show well and are priced right will be snapped up quickly. “I'm seeing buyers eager to act on homes that fill their needs as inventory remains extremely low,” he said “It's not uncommon to find you are in a competitive bidding situation right now. “Conversations with my buyer-clients have centered more around strategies for putting together a well-written and competitive offer and less about the possible implications of tax reform,” Allen said. The Northern Virginia Association of Realtors® reports on January 2018 home sales activity for Fairfax and Arlington counties, the cities of Alexandria, Fairfax and Falls Church and the towns of Vienna, Herndon and Clifton. A total of 1,097 homes sold in January 2018, a 1.17 percent decrease below January 2017 home sales of 1,110. Active listings decreased this month compared with 2017. Listings were down about 20 percent below last year, with 2,193 active listings in January, compared with 2,730 homes available in January 2017. The average days on market (DOM) for homes in January 2018 was 63 days, a decrease of 7.35 percent compared to the 68 DOM for homes in January 2017. The average home sale price rose compared with last January, to $567,710. This is up 3.21 percent compared to January 2017, when the average price was $550,069. The median sold price of homes this January, which was $475,000, rose by 2.76 percent compared to the median price of $462,250 in January 2017. The 1,444 new pending home sales in Northern Virginia in January were 2.30 percent below the 1,478 contracts that were pending in January last year. Total pending sales in January were down by almost 10 percent, to 1,720, compared with 1,910 pending contracts in January 2017. Greater Capital Area Association of Realtors®, District of Columbia Association of Realtors® and Northern Virginia Association of Realtors® to Showcase National Capital Region Investment Opportunities. Fairfax, VA -- MIPIM, the world’s leading global real estate market, business conference and networking event, will welcome Capitalize DC to its 2018 event in Cannes, France. Capitalize DC, a collaborative regional consortium formed by the Northern Virginia Association of Realtors®, Greater Capital Area Association of Realtors® and District of Columbia Association of Realtors®, will be part of the growing USA pavilion, hosted by the National Association of Realtors®, the United States’ largest real estate trade organization. NAR and Capitalize DC will be among the 3,100 exhibiting companies at the 2018 event. For the third year in a row, NAR has expanded its MIPIM exposition footprint in response to the growing U.S. presence and to accommodate new exhibiting partners. The NAR-sponsored USA pavilion provides local and regional U.S. markets the ability to showcase opportunities to 24,000 attendees and 5,000 foreign investors at MIPIM. Realtors® in the National Capital Region are being offered an opportunity to showcase their listings on the CapitalizeDC.net website that will be on display during the exposition. More than 20 Realtor® Association partners from across the U.S. will have a presence at MIPIM in 2018. “The U.S. remains the top-ranked market for real estate investors,” said Elizabeth Mendenhall, 2018 president of the 1.3-million-member national trade association. “Despite potential risks associated with emerging technologies, e-commerce, the ‘sharing economy’ and geopolitical events, foreign investors in a recent survey named the U.S. the most stable market for real estate investment and the best opportunity for capital appreciation. “Overall, the market is healthy, with commercial property prices rising 90 percent in the last seven years,” said Mendenhall. “Multiple years of steady job growth and the strengthening U.S. economy – albeit at a modest pace – makes commercial property a good bet for foreign investors looking to diversify their portfolios and generate returns outside their country of origin. “MIPIM provides a unique opportunity to showcase local property markets on a global scale,” continued Mendenhall. “While Class A asset prices in many large markets have surpassed pre-crisis levels, Realtors® in many middle- and smaller-tier markets stand to benefit from the increased interest from foreign commercial property investors. Further, the current interest in industrial and logistics properties due to the growth of online shopping, creates opportunities in markets not traditionally identified as a destination for foreign investment." FAIRFAX, VIRGINIA—April 19, 2018—The Northern Virginia Association of Realtors® today announced it has been named a 2017 Progress® Sitefinity™ Website of the Year winner in the Association category. Since its inception, the awards have been recognizing websites powered by Progress Sitefinity for creativity, design, user experience, functionality and overall website presentation. Winners were selected from the finalists based on the highest number of votes received during the public voting process. Since the launch, NVAR.com has seen a 27 percent increase in site visits, a 40 percent increase in pageviews, a 14 percent decrease in bounce rate and a doubling of attendance at its annual conference and trade expo. The 2017 Website of the Year winners were selected in two phases. First, an internal Progress jury shortlisted the three best websites per category. After narrowing the field, voting was opened to the community at large via email and social media, and the finalists with the highest number of votes were appointed the winners. This year, 51 websites developed using Progress Sitefinity were nominated across 17 categories: Consumer Goods & Services, Banking, Financial Services, Government, Automotive & Transportation, Healthcare, Manufacturing, Education, Real Estate & Construction, Services, Technology, Tourism & Hospitality, Food & Beverages, Associations, Non-Profit, Multisite and Graphic Design. The Northern Virginia Association of Realtors® serves as The Voice for Real Estate in Northern Virginia and provides a variety of services to its members including educational opportunities, professional standards enforcement, market statistics, legislative reviews, issues lobbying, multiple listing and lockbox services, and more. The purpose of NVAR is to enhance the ability and opportunity of its members to conduct their business successfully, to promote member professional competency, to maintain members’ adherence to the Realtor® Code of Ethics and to promote the preservation of the right to own, transfer and use real property. NVAR has grown to about 12,000+ Realtors® who carry out a real estate industry in a community of more than 2 million residents. Visit NVAR online at www.nvar.com, www.realtorschool.com, and www.realtorshop.com. The NVAR headquarters is located at: 8407 Pennell Street, Fairfax, VA 22031, with a second service center located in Herndon. Fairfax – With interest rates rising and the inventory of available homes diminishing, the pace of home sales in Northern Virginia has slowed compared to last year, said Lorraine Arora, the 2018 Northern Virginia Association of Realtors® Chairman of the Board and Weichert, Realtors® Fairfax regional managing broker. However, home values are holding, with the median price 7.37 percent above February 2017, at $500,000, and homes are selling at an average of 97.7% of the original listing price. A total of 1,143 homes sold in February 2018 – a 4.11 percent decrease below February 2017 home sales of 1,192. Active listings decreased this month compared with 2017. Listings were down about 19 percent below last year, with 2,396 active listings in February, compared with 2,973 homes available in February 2017. The average days on market (DOM) for homes in February 2018 was 61 days, which is a decrease of about 9 percent compared to the 67 DOM for homes in February 2017. Compared with last February, the average home sale price rose slightly to $556,791. This is up less than 1 percent compared to February 2017, when the average price was $552,942. Some entry level buyers are taking their time. Realtor® Dallison Veach of The Veach Realty Group with RE/MAX Executives sees that entry-level clients of all ages can be frustrated. “I was working with a first-time home buyer, with a modest income as a [long-time local] teacher. She's been renting all her life and decided to buy because [of rising rents],” she said. Her client had a Virginia Housing Development Authority loan, and bid full-price on two condos. Both offers were rejected because the client couldn't participate in a bidding war that would have priced her out, Veach said. My client ultimately decided to continue to rent. Fairfax – April home sales numbers hit a record high for the past decade in the combined area of Fairfax County, Arlington County, Alexandria and Falls Church, with 2,079 sales, which is 4 percent higher than the 1,996 homes sold last year at that time. “While we are nearing the height of the spring season, we have already reached a high water mark this year with April’s sales,” said Lorraine Arora, NVAR chairman of the board and Weichert Fairfax Regional managing broker. “It is actually the best April in the last decade for the total number of sales in our NVAR footprint. This sales activity reflects a sound buying climate. It shows that our buyers’ timing of the market, decisions about their housing choices and their mortgages have aligned,” she said. Active listings decreased this month compared with 2017. Listings were down about 17 percent below last year, with 3,396 active listings in April, compared with 4109 homes available in April 2017. The average days on market (DOM) for homes in April 2018 was 29 days, a decrease of about 19 percent compared to the 36 DOM for homes in April 2017. “With our Northern Virginia local economy in a great place regarding employment numbers, we do not think our region’s economy is at risk to overheat any time soon, said Lorraine Arora, NVAR Chairman of the Board. “Even though the Fed just inched up interest rates, there is still pent up demand. This rate hike will ensure that economic growth remains moderate. Buyers need to prioritize their requirements and make some adjustments of their wish lists to find a home in their price range that checks off most boxes,” she said. Sellers need to adjust their expectations as well since, in this market now, homes sell in days or weeks rather than in hours, she explained. Education is the most critical issue for buyers right now, as they need to understand market innuendos, explained Gary Lange, Weichert, Realtors® Vienna managing broker. “According to my agents, buyers have a stop-and-go mentality,” said Lange. “[Clients] are hot and heavy looking, then go cold pretty quickly. Some of that may be due to lack of inventory; they are looking for a deal or they just don’t have a serious need to buy. “Agents must counsel buyers and sellers about the way the housing market works,” he explained. “[Such insight] would help slow down the rate at which buyers back out over minor home inspection issues. Sometimes buyers have successfully bid for a home, then realize the home really isn’t for them or they paid too much. It is easy to get caught up in the moment when a buyer makes a hasty decision about a home for fear of losing that opportunity,” Lange warns. Heather Embrey, associate broker at Better Homes & Garden Real Estate Premier, saw tons of action from her serious clients. “This May market was robust – maybe too robust for buyers,” she said. “Some decided to stay put instead of battling against multiple offers. “Sellers became over-confident and priced properties unrealistically, only to feel frustrated when savvy buyers passed them by,” she said. Embrey remains optimistic that the June market will have a better balance, especially with her seller clients who have unrealistic expectations. The average home sale price rose slightly, compared with last May, to $607,886. This is up about 3 percent compared to May 2017, when the average price was $589,080. Fairfax, VA – The Northern Virginia Association of Realtors® is pleased to announce the hiring of Paula Martino to the newly-created position of Realtor® Political Action Committee development strategist. “In an effort to increase NVAR Realtors® Political Action Committee investments and to strengthen NVAR in the local and state politi­cal landscape, we hired Martino to create a new fundraising campaign as part of our Vision 2020 Strategic Plan,” said NVAR CEO Ryan Conrad. “Enlisting Martino’s talents and national expertise will provide the sparks we need to enhance the association’s NV/RPAC culture. A successful NV/RPAC campaign ultimately helps our members’ businesses by raising consumer and legislators’ awareness. They will better understand the importance of a robust and thriving real estate market for local homeownership, homebuying and sustainable economic prosperity. Formerly the National Association of Realtors®’ director of corporate fundraising, Martino was responsible for the launch of NAR’s Realtor® Party Corporate Ally Program. Last year, that CAP program raised $1.35 million for Realtor® Party advocacy at the local, state and federal levels. As the government affairs director for both the Southern Maryland Association of Realtors® and the Maryland Association of Realtors®, Martino successfully created RPAC investment campaigns that exceeded annual goals each year with the help of a team of dedicated volunteer members. “I am delighted to be on board with NVAR because I see the great opportunity to create and develop an exciting new approach to RPAC fundraising,” Martino said. “I look forward to working with NVAR staff and leadership on a campaign that will grow and be appreciated by the association’s 13,000 members as a valuable tool for NVAR’s Public and Government Affairs efforts,” Martino said. A graduate of the University of Maryland at College Park, Martino earned a bachelor of science in business and a master’s degree in art history. She is also a graduate of the Women’s Campaign School at Yale University and a certified professional fundraiser. For the photograph of Paula Martino, please click here. The Northern Virginia Association of Realtors® serves as The Voice For Real Estate in Northern Virginia and provides a variety of services to its members including educational opportunities, professional standards enforcement, market statistics, legislative reviews, issues lobbying, multiple listing and lockbox services, and more. The purpose of NVAR is to enhance the ability and opportunity of its members to conduct their business successfully, to promote member professional competency, to maintain members’ adherence to the Realtor® Code of Ethics and to promote the preservation of the right to own, transfer and use real property. NVAR has grown to about 13,000 Realtors® who carry out a real estate industry in a community of more than 2 million residents. Visit NVAR online at www.nvar.com, www.realtorschool.com, and www.realtorshop.com. Contact the Northern Virginia Association of Realtors® at 703.207.3200. The NVAR headquarters is located at: 8407 Pennell Street, Fairfax, VA 22031, with a second service center located in Herndon. Market Minute Video: NVAR Market Minutes: 2018 Dodd Frank Reform: Good or Bad for Local Housing? Fairfax – July was a hot month for Northern Virginia in more ways than one; turns out that the rainy weather enticed house hunters to step up searching. With homes staying on the market for a shorter timeframe, prospective home buyers are struggling to keep their cool as they compete for this region’s limited inventory of homes for sale. 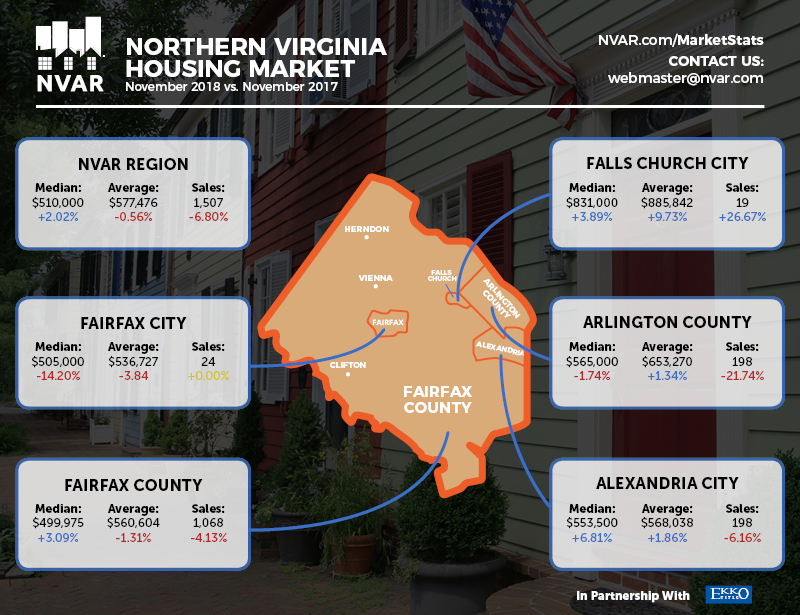 Fairfax – With many August home sales data points tracking horizontally or up, leaders at the Northern Virginia Association of Realtors® conclude that the anticipated expected tax deductions have not adversely affected Northern Virginia home sales. “For the short term, the limits to the state and local tax deductions (SALT) appear to be only a slight headwind to buyer confidence in our region,” said 2018 NVAR Chairman Lorraine Arora. “We are showing slight increases in our average sold and median sold prices for August along with homes that are on the market an average of 34 days.” She pointed out that the 2,036 home sales in August reflect a stable trendline in the local housing market with overall average equity gains. Boston, MA -- The Northern Virginia Association of Realtors® Global Council received the Platinum Global Achievement Program Award from the National Association of Realtors® at the NAR Convention in Boston on Nov. 3, 2018. This places NVAR Global in the top 10 percent of Global Councils nationwide, according to NAR. The 2018 NVAR Global program consisted of initiatives such as trade missions to foreign countries; member involvement as NAR President’s Liaisons to Guatemala, Spain, South America, Vietnam and Cambodia; representation at the international real estate conference, MIPIM, and regional partnerships to create Capitalize DC. According to the 2018 NVAR President Lorraine Arora, “Our 2018 NVAR Global Council provides the highest level of service to our members by consistently providing them with tools and resources they need to excel in cross-border investment for both commercial and residential transactions. NVAR offers the Certified International Property Specialist Designation (CIPS) training. We, at NVAR, also host Korean, Hispanic and Vietnamese Cultural Forums as well as events that analyze global opportunities in the local market. “We are especially thrilled for this year’s honor, as it marks our third consecutive year; this keeps us on track to qualify us for the NAR Diamond Global Achievement Program Award in two years,” she said. The NVAR Global Council was formally recognized at the NAR Conference’s International Night Out. The Northern Virginia Association of Realtors® serves as The Voice for Real Estate in Northern Virginia and provides a variety of services to its members including educational opportunities, professional standards enforcement, market statistics, legislative reviews, issues lobbying, multiple listing and lockbox services, and more. The purpose of NVAR is to enhance the ability and opportunity of its members to conduct their business successfully, to promote member professional competency, to maintain members’ adherence to the Realtor® Code of Ethics and to promote the preservation of the right to own, transfer and use real property. NVAR has grown to nearly 13,000 Realtors® who carry out a real estate industry in a community of more than 2 million residents. Visit NVAR online at www.nvar.com. Contact the Northern Virginia Association of Realtors® at 703.207.3200. The NVAR headquarters is located at: 8407 Pennell Street, Fairfax, VA 22031, with a second service center located in Herndon, VA.
“Amazon HQ2: Impact on Local Housing Markets”, a symposium on the potential impact of the Amazon HQ2 project on housing demand, supply, and pricing in Northern Virginia. The event will take place on Wed., Dec. 12 at 5:30 p.m. at the Founders Hall Auditorium on the George Mason Arlington campus. The symposium will feature local housing experts Jeannette Chapman (Deputy Director, Stephen S. Fuller Institute, George Mason University), Danielle Hale (Chief Economist, Realtor.com), Ben Sage (Director for Mid-Atlantic Region, Metrostudy), Michelle Winters (Executive Director, Alliance for Housing Solutions), Sandy Paul ((Senior Managing Director, National Research - Newmark Knight Frank), and Christian Barreiro (The Zupancic Group of Marcus and Millichap). Amazon HQ2, one of the most anticipated national corporate expansions, will be situated in newly branded National Landing, in Northern Virginia with an expectation of 25,000 full-time high-paying jobs; approximately $2.5 billion in Amazon investment; 4 million square feet of office space with the opportunity to expand to 8 million square feet; and an estimated incremental tax revenue of $3.2 billion over the next 20 years. Said NVAR CEO Ryan T. Conrad, “We aim to ensure that Realtors®, business leaders and the community are fully informed about the housing demands created by Amazon’s move. One thing we know is that we are very different from Seattle. Our local economy and housing market are positioned to absorb these new needs, and we are confident that our highly competent and professional Realtor® members will provide excellent service to those seeking a new home anywhere in our region.” The association will track the trends, data points and infrastructure developments so our community is out in front of this, he said. To accommodate high demand of interest from local Realtors®, NVAR is hosting a simultaneous watch party on Dec. 12 at its Fairfax headquarters, 8407 Pennell St., Fairfax, VA. The Center for Real Estate Entrepreneurship (CREE) at the George Mason University’s School of Business (http://business.gmu.edu/realestate/) is the university’s connection with the real estate industry and supports real estate education through a Masters in Real Estate Development program and industry-focused educational events and collaborations. The Northern Virginia Apartment Association (NVAA) was founded over 60 years ago with the clear purpose of representing, protecting and promoting its membership’s business interest in Northern Virginia. With this strong foundation, today’s NVAA is built upon 3 pillars: Advocacy, Education and Elevation. No other professional association has as its exclusive focus your interests in the rapidly evolving Northern Virginia region. NVAA focuses on (1) championing the industry’s legislative priorities at both the local and state government levels, (2) on providing both upper level and practical education and training to both owner members, managers and staff, and (3) on providing professional networking opportunities through various events and activities for all members of the industry. Contact NVAA at https://www.nvaaonline.com/. The Northern Virginia Association of Realtors® (NVAR) serves as The Voice for Real Estate in Northern Virginia and provides a variety of services to its members including educational opportunities, professional standards enforcement, market statistics, legislative reviews, issues lobbying, multiple listing and lockbox services, and more. The purpose of NVAR is to enhance the ability and opportunity of its members to conduct their business successfully, to promote member professional competency, to maintain members’ adherence to the Realtor® Code of Ethics and to promote the preservation of the right to own, transfer and use real property. NVAR has grown to nearly 13,000 Realtors® who carry out a real estate industry in a community of more than 2 million residents. Visit NVAR online at www.nvar.com. its $41,000 in Donations to 19 Nonprofit Beneficiaries. Fairfax, VA – The Northern Virginia Association of Realtors® donated $41,000 in outreach and philanthropy to 19 local nonprofits through its NVAR Cares Committee in 2018. This committee considered proposals for funding from local nonprofits and made decisions to donate time and money based on each mission’s alignment with NVAR’s goals for charitable giving and its strategic plan. The largest donation went to the Habitat for Humanity Over the Edge fundraiser, which NVAR served as the Media Day Sponsor for in 2018. In addition, NVAR awarded its second NVAR Hero Award to Nora Partlow, a Realtor® with Coldwell Banker, who was nominated by the Neighborhood Health nonprofit in Alexandria. On Nov. 8, 2018, the NVAR Cares Committee hosted its first fundraiser, “Party with a Purpose,” at the Paradise Springs Winery in Clifton.